< This needs to be said, and said, and said, until it sinks in. I so hope you show us the finished product. I have been captivated by the work you show. Keep it up, it is lovely to think that people still do this stuff. i love paper and thread together! 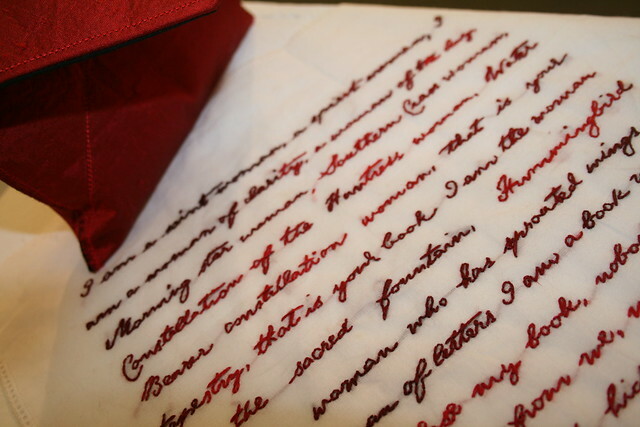 I love your embroidered letter – so beautiful. Is it embroidered on paper or fabric? 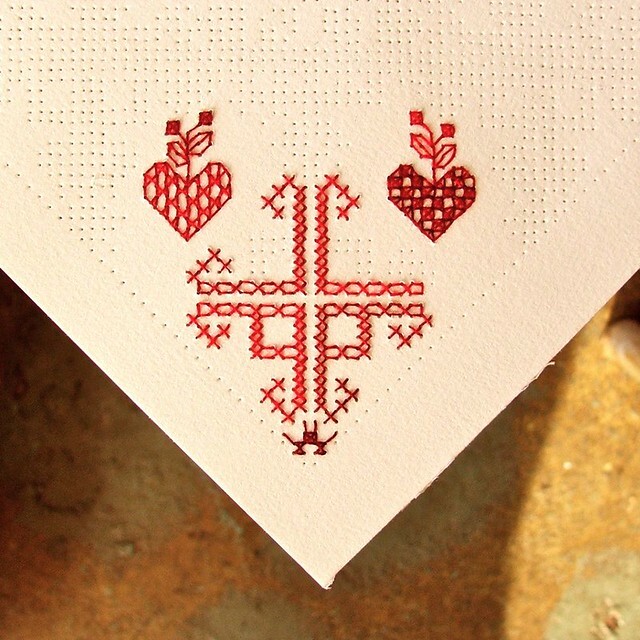 It reminds me of an antique handkerchief. The two-tone red is sublime. 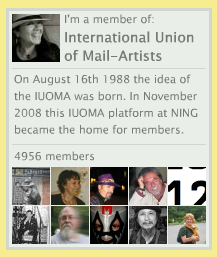 I’m working on a similar pin, thread and paper project – something tells me your collaboration will be superior though. I hope you both share it when you’re done! Hey, I thought of your Pen Missing Pal post, as I pricked the holes out. It may even be that your inkless letter got me started on this! 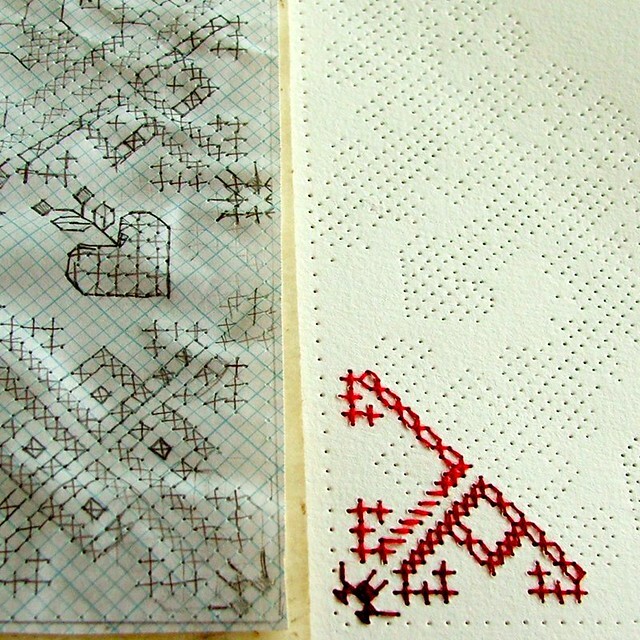 The current cross-stitch piece is on paper, the old embroidered work with lots of words is on a handkerchief. Pretty sure Kat means to share it all over the place! I do not know about superior, or inferior, it’s all just stuff we do, and I loved the inkless letter so much, much better than I like my own work. It’s all relative, isn’t it? Ohhhh it is a handkerchief. So, so nice! You are a wise and kind woman. So true, it is all relative (including the moments of self-doubt). I love your embroidery work so much that it is seeping into all that I want to do. Three cheers to the “stuff we do.” And thank goodness for it too. Thanks, pointdextr, nout much skill necessary, though…some graphing paper and a pin is all you need; and cross stitch is one of the easier stitches to work. Give it a try! It looks more complicated than it is. 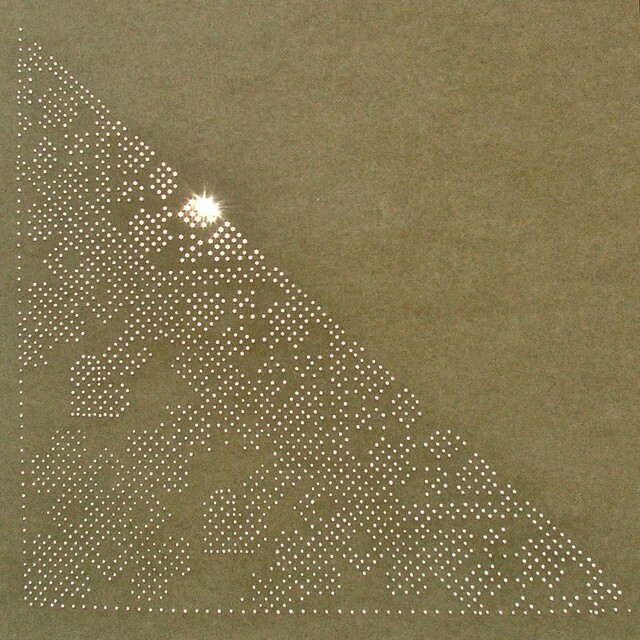 The trick with such small squares is to use a fine pin, and then a small needle, so you don’t stretch or rip the holes. Explore it! These reds contrasted against white are beautiful. You’ve got me inspired to pick up my embroidery project that has been languishing for some time now. That’s great! 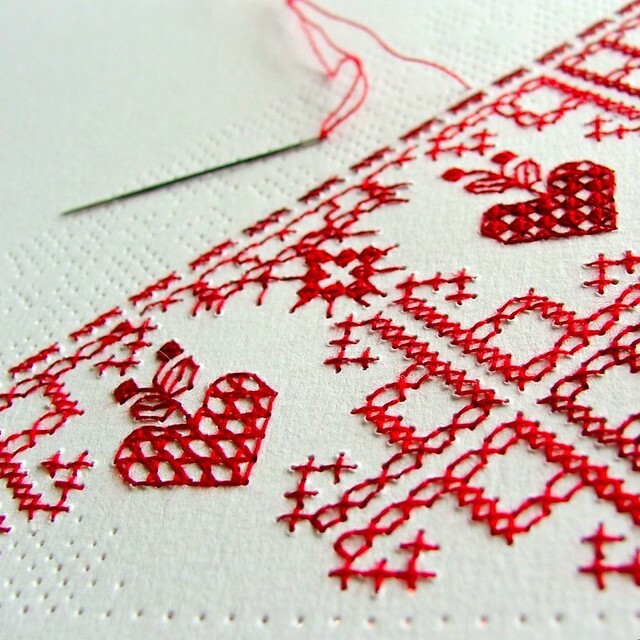 Yay, dig that embroidery up and do something gorgeous with it! Thanks for the visit!